Mack McGee: Good afternoon everybody. 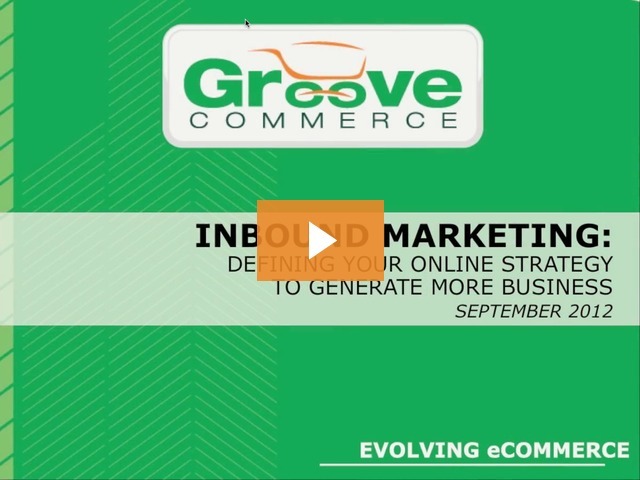 Thanks for joining us for the September edition of the Groove Commerce Webinar Series. This month’s topic: Inbound Marketing—Defining your online strategy to generate more business. First and foremost, welcome to those people that are new to the Groove Commerce Webinar Series. I’m Mack McGee. And, as always, I want to welcome our host, CEO and Founder of Groove Commerce, Ethan Giffin. Ethan Giffin: Thank you, Mack. Excited to be here today to talk about inbound marketing. Mack: So, Ethan, obviously a very pertinent topic because we’ve got a large audience today, over 100 organizations joining us to learn more about inbound marketing. So, exciting content. Want to get to it in a minute. Do want to tell those people that are new, first of all, thank you for joining us and taking time out of your day. We hope that you’ll find the webinar to be very helpful. It’s an interactive session. Submit questions. We’ll get to all of those at the end. But real quick, want to give you a little bit about Groove Commerce. We’re a full service interactive agency focused on helping people generate more business through their online presence. We provide web design, online services, as well as online marketing services to insure that you have a strategy that can help you generate more business online. And so, with that, Ethan, I want to hand things over to you and let’s get started with today’s webinar. Ethan: All right. Thanks, Mack. We’re going to start with our first poll of the day. We’re going to ask people, on a yes or no basis, do you know what inbound marketing is? Yes or no? We’ll give you a second here to answer. Excellent. Lots of great answers. It looks like most of you are not aware of what that is, so that’s great for us to dig into today’s agenda. So looking at today’s agenda, first we’re going to talk about what is inbound marketing? We’re going to give you a definition of inbound versus outbound and how the landscape has changed, and how customer behavior has changed as the internet has evolved. So that’s the second topic of today’s agenda. The third thing we’re going to look at is the elements of a successful inbound marketing campaign—how to create that inbound marketing blueprint. And then, lastly, we’ve got plenty of time for Q&A today to answer all of your questions. So, as Mack mentioned, my name is Ethan Giffin. I’m the CEO and Founder of Groove Commerce, and I’m going to be your host for today. So, outbound marketing. That’s where businesses push their outbound messages to consumers. These techniques are very old school and include things like direct mail, telemarketing, radio, and trade shows. So you kinda see the guy with the megaphone, he’s kinda screaming his outbound message at you. Traditionally, this is how people in businesses would communicate and try to sell their brands. And the new school of thinking is what we call inbound marketing. It’s a set of marketing strategies and techniques focused on pulling relevant content and prospects and pulling those customers and prospects towards a business and its products. So again, you are putting things in front of people as they are looking for them. So that’s the definition of inbound marketing; like a magnet you are pulling them in. So all the stuff you are told to do—blogging, Facebook, Twitter, Pinterest, LinkedIn—all the things that people tell you, you have to do, but no one ever tells you why you have to do it. So what’s what we want to look at today—the why of inbound marketing—why you should blog, why you should be looking at things socially like Facebook, LinkedIn, Twitter, and things like email, etc. One of my favorite books is from Simon Sinek, his book “Start with Why”. He had an amazing tech presentation a few years ago that most people know what they do, some even know how they do it. But very few people in very few organizations know why they do things. So defining that why for you is a very, very important piece. We call that the Golden Circle. Everyone can kinda figure that outer circle. Many can get that middle circle. But very, very few can kinda get that inner circle, the bull’s-eye, so to speak, of why we do things. So how has customer behavior changed? Let’s think about that why aspect. I want to give you a couple stats along the way that are just mind blowing and that will really help you grasp what people are doing and why you should be engaging throughout these avenues of inbound marketing. 78% of internet users conduct product research online. This is here is Mack with his knuckle tattoos and the Nintendo belt buckle. So, 78% of users are conducting product research online. That’s an astounding amount of folks every day. 10.3 billion searches are conducted every month on Google. That’s an old stat from ComScore and that’s increasing more and more every month. As these Storm Troopers are looking for, the Droids we’re looking for. So again, 10.3 billion searches plus every month on Google. One-third of US consumers spend three or more hours online every day. Again, the television and DVD’s are being replaced very, very fast by the internet. So things like Facebook, LinkedIn, Twitter, blogs, all of these things are engaging people on a huge amount of basis every day. You are seeing conversions with items like Apple TV trying to pull the web more into television. It’s just a lot of folks that are looking and searching every single day. Out of the US internet users, they spend 3X more minutes on blogs and social networks than on email every day. So things, again, like Facebook, online gaming, email, they have tremendous attachment. But social networks, Facebook, people are literally becoming addicted to things like Facebook and Twitter and Pinterest. So how are you going to be in front of those people as they are out there just looking around? 70% of the links search users click on are organic, not paid. Again, people tend to trust the organic links more. That’s not to say that pay-per-click isn’t a valuable way to drive traffic very fast. But again, building that slow burning organic strategy is a very, very important aspect. Companies that blog get 55% more site visitors than companies that don’t. Again, an astounding number. How are you blogging? What’s your frequency? 57% of businesses have acquired a customer through their company blog. I know that we have. We have several blogs that are what we call six figure blogs in terms of engagements from leads. People find these blogs in Google, come in, and they come interested about the services that we offer. Next, 67% of B2C companies, including 51% of B2B companies have acquired a customer through Facebook. Again, a staggering number to which we can include ourselves in. And that is a lot of folks. So, are you engaging in those markets? 42% of companies have acquired a customer through Twitter. Again, a lot of folks engaging in Twitter. So thinking about our poll, we’ve discussed a little bit about inbound marketing. How do you think you are doing? On a scale of 1-10, do you think you are doing good? A 2, like OK, or a 10, I’m kinda failing? So let us know that. We’re going to let that run for a second. Most people feel like they are kind of either in the middle of the pack or below average. So, definitely not covering all of the aspects of things that they want to look at. So let’s think about the elements of inbound marketing. Let’s go through those elements and discuss them piece by piece, figure out what you are missing. I really think about it like a hub and spoke method with your website being in the middle. You know, that inbound marketing, you know, here we are, all of those elements again, that kind of hub and spoke—a blogging and content strategy, public relations, search engine optimization, PPC, social media, conversion optimization, email nurturing. These are all the seven elements that we look at when building an inbound marketing strategy for folks. Are you blogging enough? Do you have regular blogging frequency? Are you creating offer based content such as e-books? Are you putting press releases out about the products and services that you offer? Are you optimizing your site for organic SEO? Are you running paid search? Are you engaging social avenues? Are you looking at how your site is reacting and changing calls to action to increase the conversion on your site? And then, are you kind of email nurturing folks that have contacted you and are becoming leads and prospects within your system? So these are the seven elements of an inbound marketing campaign. This is what we kind of call your inbound sales funnel, right? You’ve got your top of the funnel, or TOFU, you’ve got your middle of the funnel, or MOFU, or you’ve got your bottom of the funnel, or BOFU. And at the top of that is really kind of getting found. Are you on Facebook? Are you driving traffic from an RSS feed to your blog? Are you tweeting and engaging? Are you on LinkedIn? Is your blogging strategy and content on your site optimized through Google and Google+? Are you creating video content and putting it out there? Just getting found. So this activity here of being on this webinar today is a conversion. So we would kind of consider the folks that are on this webinar today people that are moved to the middle of the funnel; they are actively engaged in Groove and the content we create. And you are taking the time out of your day to get on an hour long video and sit and hear that content and ask questions. Basically, an anonymous internet visitor may be at the top of the funnel. The middle of the funnel is offers, and e-books, and webinars. And ultimately, you want to analyze that as they become customers at that bottom of the funnel and make sure that you are converting them within your sales process. So really thinking about your site as an inbound sales funnel is a really, really important method. We really like to kind of break down that funnel. And again, that top of the funnel is getting found, so blogging, the SEO, the pay-per-click, the social media. That drives folks into your site that may be slightly interested in the things that you are looking for. You push people into that middle of the funnel, or the MOFU, by offering compelling offers, compelling calls to action. Optimizing your site for conversion, email nurturing and trickling. You know, how are you going to put email in front of folks? It’s not just an email newsletter anymore. How are you going to put relevant content in front of people as they desire it? And then how are you tracking that bottom of the funnel? You know, things like Google Analytics. We happen to love a product that helps us with our analytics in all of these aspects of tracking the funnel called HubSpot that we’ve become engaged with and that has helped us to significantly increase our web traffic and our engagement along the way. So that’s really kind of breaking down thee funnel there. Again, think about the TOFU, the MOFU, and the BOFU. Again, kind of tying back into that blogging, frequency really wins. So the percentage of blog users who acquired a customer through their blog. People that are blogging less than monthly or monthly have a significantly lower percentage than those that blog weekly or multiple times per day. And again, that stat came from a survey from HubSpot, a great product that we endorse. But again, the more content that you are putting out over time, that’s a slow build, the more return visitors that you are going to create. So, thinking about your blogging frequency is very, very important. Social media. This is how you connect with your most loyal customers. You are able to focus on customer service opportunities for people complaining about things and complaining about your operation. You want to track that and make sure that you are able to communicate with those folks. There’s been some great cases studies out there by people like Bank of America and Comcast how they have created excellent customer service channels out of their Twitter feeds. These are additional channels for promotions and events. So are you creating contests around Pinterest? Are you creating YouTube video contests? All of these help to increase traffic to your site. And as you’ve seen from many of the previous webinars where we dug into the changes about the Google Panda update, we’re seeing a lot of these social elements affect your overall search engine optimization. So we know that the social engagement of people that like your page and share your content on Facebook and Twitter is affecting your overall Google ranking. So, very, very important and plays a significant role in what you are doing. Thinking about that conversion optimization, this is the thing that most people don’t do. But you really want to think about increasing your conversion rate. So how can you test changes to your copy? You know, lay out your usability, your buttons, your button text, your headlines, all of those images that you use, the videos that you offer, all of those are going to cause a change in behavior for visitors. So you want to make it easy for visitors to navigate your site. You want to appeal to the different types of shoppers that come on your site. Are they casual? Are they more direct? And you want to keep customers moving through the funnel. You spend a lot of money on pay-per-click. You are spending a lot of money, even if it’s just internal time, on this blogging strategy to keep people moving through that funnel. You want to figure out how to start to collect information from them sooner rather than later. And there’s the four basic types of shoppers that engage on a website—spontaneous, methodical, competitive, and humanistic. And we’ve talked a lot about those in previous webinars. But you want to make sure you are catering to all those folks. On the other side of the screen at the bottom is a heat map of where people tend to focus on a page and click. So there’s a lot of great tools out there that we utilize when we’re doing conversion rate optimization on a site to help optimize it and push it to the next level. You want to analyze all of your activities. This is an example screenshot out of HubSpot’s dashboard. We utilize it in a way to basically track all of the sources of traffic. We want to look at things like visit to lead ratio, the total number of leads, and lead to customer ratio. So we want to be able to break that down and think about things not just as clicks and eyeballs. You really want to think about that as how are you turning things into leads? And for us, we look at it from a couple of different levels. Yeah, we do look at people that fill out a contact form on GrooveCommerce.com as a lead, but we also look at people that sign up for our email list, or our webinars, or download an e-book. We have call tracking enabled so that we’re able to kind of track where our specific traffic is coming from, whether that be vendor profiles or paid search. You want to think about how you are pulling all of those bottom of the funnel activities so that you can analyze that in one place. That’s one of the reasons why we’ve recently partnered with HubSpot. We think it’s been a great fit for us. You want to be able to keep your contacts and analytics, again, in one place. This is a very, very interesting example of a visitor profile when they first visited the site, the life cycle stage that they’re in. We’re able to tell all the different content pages they looked at, anything they signed up for, and how they engaged for the site. We’re also able to note when they revisited the site and get an email notification of that. So you want to think about how you have those contacts and analytics in one place. And most people kind of have these in those separate silo’d systems that don’t work together. So you want to be able to tie all that back together with your sales force or whatever CRM that you use. We happen to be a fan of Sales Force here. One of the other interesting things that you want to look at is what prospects are visiting your site that you don’t quite know about yet? These are people that haven’t filled out a lead form, or signed up for a webinar, or have done anything else yet. These are just kind of various corporations that are visiting the site. And you can kind of find out this information based upon their IP address and organization. We want to look for specific companies, specific geographic areas that are visiting our site on a regular basis. We’re able to tell that by their network signature. Again, that helps you to start to research the people that are looking at your site. Maybe they are a little shy and you can start to figure out other ways of engaging with them. But that gives you a lot of information on who is on your site if you send out a respond to a proposal to someone and you want to see if they are back on your site kind of looking around. Again, great ways to put that out there, find those folks, and kind of make sure that you are engaging those prospects. I kinda talked a little bit about the analytics and email in one place, but it’s really kind of what we call closing that loop. It’s having a single place to have your contacts database, but how are you going to pull social media into that? How are you going to pull the marketing automation into that? How are you going to have your analytics track your SEO, your email nurturing, and the landing pages and content creation? Again, having that all in one place has really helped us to kind of succeed and take our business to the next level as Groove, and we think it can help you too in terms of that. Like Microsoft, we like to eat our own dog food and see what’s very, very important in something that we’ve been working on for quite some time. Actually, I’ve been working on a new website design for Groove kind of based upon the analytics and metrics that we’ve kind of pulled from our inbound marketing campaign. So creating an inbound marketing blueprint is the next step. How are you going to create that blueprint? There’s not a one size fits all. You need to think about your organization. So let’s kind of think about the magic letters GPCT. Kind of my favorite letters, an acronym that I like to say all the time. It’s Goal, Plan, Challenges, and Timeline. What’s the goal that you want to accomplish? What’s your plan to accomplish that goal? What are the challenges you face with that? And then what’s your timeline? Is it something that you want to do on a monthly basis or achieve in one month? Is this something you need to achieve on a quarterly basis, a half yearly, or a yearly basis? So your goal maybe, I would like to create one new blog post a week. My plan of that is we’re going to have a blogging brainstorm session with Groove. We’re going to come up with 50-100 blog topics. The challenges may be: how do we get those written? And again, that may be another area where we help. And what’s the timeline to get there? So maybe you’d say maybe by the end of a quarter you want to be blogging once a week. And so, really kind of putting that together. There are things that are more of a slow burn. Things like organic SEO may take you 6-8 months to really kind of get there and get your momentum going. Whereas, paid search may be something that could be achieved, that momentum, in 60-90 days. Other things like email marketing and such, they may take a little bit longer. It really kind of depends upon what your internal challenges are, budget, etc, and that allows you to kind of put that together. But GPCT is how you really should be thinking about your online marketing, your inbound marketing campaigns. Some of the goals that we think you should consider along the way that you should be looking at in terms of defining are, you know, what’s your monthly visitor goal? How many visitors? Where are you and where do you want to be? And how long is it going to take you to get there? And how are you going to do it? How many leads per month are you getting? And those are just general folks that are engaging on your site in one way or another. What’s your conversion rate? What’s the percentage of visitors to leads on your site and how are you going to increase that? So if you are, let’s say, a B2B lead gen site and your goal is to get 7,500 visitors a month at a 2% conversion rate, that’s X amount of leads. Whereas, if maybe you are an e-commerce site, you are trying to get a million visitors a month to your site and get a half percent conversion rate, depending upon your industry, or higher. So again, you want to map that out. I tend to look at these things kind of like Weight Watchers. You don’t want to go completely crazy with these goals. In Weight Watchers they ask you to basically lose 10% of your body weight. I would tell you that you want to definitely set some easy goals that you can achieve and show some success with this, or else you are going to give up like a diet and kind of just ignore it. Marketing qualified leads. So outside of all of the folks that may be spamming your site, filling out lead forms that aren’t really a fit, how have you defined your overall marketing personas and customer personas, and what equates into a marketing qualified lead—someone that absolutely fits your customer personas, they’ve engaged in the site, they’ve given their information, and then they’re somebody that you want to stay in touch with along the way? You may want to look at a goal to grow your email list size, blogs, comments, etc. Facebook likes and shares—again, how many likes do you have on your Facebook page? How much of your content is being shared? How many Twitter followers do you have and what kind of retweets do you have? These are some goals to consider in laying out that GPCT chart. So what’s the optimal frequency? Everyone asks that. Well, it depends. You want to test, test, test. There isn’t necessarily, again, a one size fits all optimal frequency for your inbound marketing campaigns? How often would your audience want to hear from what you provide? That’s the first question to ask. We do have some general rules of thumb to kind of get you out. We tend to think of things as kind of a fast, faster, and fastest methodology. So, how can we apply those to your business? And how can we put together that kind of fast, faster, fastest campaign across all of these channels to engage your customers? So blogging, somewhere between 1-3 times a week typically is that best frequency. Email, one to two times per month depending upon quality and content, if you are doing nurturing. Those are kind of very specific based upon customer actions on your site. Social I would say 1+ per day as long as it’s relevant. You could absolutely Tweet more if you have enough Twitter followers versus Facebook. You may not want to post more than once or twice a day. So again, these are just general rules of thumb. You don’t want to annoy your audience. You want to make sure that you are engaging them and communicating with them at a frequency that they want to hear from you. So some of the questions that we want you to ask yourself. Are you blogging enough? Are you engaging enough socially? Two very important things. Are you creating offers that convert? Are you figuring out what those offers are? Are you mapping them to your top of the funnel, middle of the funnel, bottom of the funnel? Are you mapping those offers to the specific types of personas around each product and service that you offer? For us, our personas are very different based upon whether you are a shopping cart based website or if you are a B2B lead generation site. So again, are you creating those offers that engage all those personas that convert? Are you nurturing those leads with emails? Are you communicating with those folks on a regular basis? Are you sending information along the way as they need it? I’m not just talking about PDF’s of sales slicks. But how are you kind of showing yourself as an industry expert and putting out content around that expertise? Are you closing the loop with tracking? Again, that’s one of the biggest aspects that most people don’t do. Many companies are spending money on paid search, spending money on social, they are blogging, they are doing all these things. Why aren’t you tracking it the right way? That’s how we’ve kind of engaged and started using the HubSpot product ourselves with great success. These are some questions to ask yourself. Just remember one thing: creating good content is hard. You’ve got to make it work for you. There’s a lot of ways to create good content and it doesn’t have to be like pulling teeth. But it’s not easy and that’s why everybody can’t do it. So with that we’re going to ask poll #3. I think poll #3 is around would you be interested on an inbound marketing assessment from Groove Commerce? Mack: So go ahead real quick, folks, and let us know if you’d be interested in taking our inbound marketing assessment. Quick yes/no. Looks like we’ve got a majority response there. All right. And so with that, Ethan, first of all, thank you. We’ll let you catch your breath for a second. A lot of great content there. Obviously, just a lot to consider when putting together an inbound marketing strategy. Ethan: Yeah, Mack. I mean I could speak about this for hours. We could do an hour or two on each aspect and each element of inbound marketing. So to kind of put all this together in a one hour segment is challenging; a little bit of a marathon there. But definitely would love to answer some questions. So please start typing those in. Mack: Plenty of questions to get started. I appreciate everybody that’s submitted them so far. Keep ‘em coming. With that, we want to go ahead and thank everyone and let you know about our next webinar coming up in October. Really excited about this one. We’re partnering with a great partner of ours, SearchSpring, to bring you a topic on e-commerce site search: improving the user experience for increased conversions. Ethan talked about all of those things that he could dive into detail on, well this is one of them: getting those people into the hub of a site and discussing site search. This is going to pair us with one of our great partners to talk about what is really a huge, huge impact on conversion, which is internal site search. Ethan: Yeah. I mean I think site search is often an under looked area on e-commerce sites. And I can tell you that when we’re looking to engage and increase conversion rate, the first place we look is site search. The second place we look is checkout. If it’s not been taken care of, it’s like a garden and landscaping. Your site just doesn’t have care and feeding then it’s not going to provide good results. So we’re going to spend a little bit of time next month going through that and figuring out what are some easy ways for you to kind of do that, care and feeding, and get the best results possible? Mack: So with that, Ethan, let’s kick off this Q&A session. A lot of great questions here. We’re going to start with one that actually came up towards the end of your presentation there. You said good content is hard. This person wants to know, what do you think makes good content? Ethan: I think good content is something that speaks to your customers, speaks to your visitors and gets them to really think about you as an expert in your field and gets someone to want to basically engage with you. Again, it’s almost like a band on stage. You want to make people wanting one more song. So as you are creating a blog, you don’t want to give away the how-to book to everything that you do, although some transparency isn’t bad. But you do want to make sure that you have people wanting more and that they are thinking about you as an industry expert within your field and engaging with you as an organization. So, creating good content that engages is important. There are a lot of ways to do it. We lead people through some blogging brainstorming sessions, really trying to come up with those 50-100 blog ideas, thinking about the questions that your prospects are asking your sales people, the questions that your current customers are asking your customer service. Like, how do you put all of that together and create blog posts about that? That helps in a lot of different ways, and it also shows a lot of credibility that if you are speaking with a prospect on the sales side, “Oh, we have a blog post about that. Let me send you that.” Or if you are on the customer service side, “Oh, we wrote a blog post about that. Let me send you that.” There’s no one size fits all anymore, so being able to have those things handy and pull them out shows a lot of credibility. So again, I consider that good content. Mack: All right. Great. The next question, your favorite question you get asked on stage all the time: What should my conversion rate be? Ethan, what is a good conversion rate? Ethan: I think it should be 1,000 trillion percent. Seriously, I think it changes based upon every industry. We’ve seen sites where a quarter of a percent is good. We’ve seen sites where 9% or 10% is good. If you have a B2B site that is in the lead generation space, I would really want to make that conversion rate be somewhere between 2% and 8% or 10%. If you are really good and really engaged, you could probably get above that. But I would say that most sites that we look at barely even have a 1% conversion rate, yet they’ve got some decent traffic. I would also say the same thing for e-commerce sites. Really, somewhere between that 2% and 10%. Again, if you are selling consumer electronics or other things, that conversion rate is going to be lower. But if you have unique products, it could be significantly higher, especially if you serve the manufacturer or you are selling consumables. Those conversion rates can be impacted upon significantly with a little bit of fine tuning. Mack: Great. This next person is talking about selling in the concept of inbound marketing to their executive team. In terms of setting expectations, obviously a lot in play for an inbound marketing strategy based on what you’ve shared today. What’s a timeframe when people start to see the ROI on a good inbound marketing strategy? Ethan: I mean I think that, really, you’ve got to have executive buy-in on these things. You need to figure out how you can create content. You need to figure out what the best avenues for your executives are to push content out. Maybe it’s avenues such as video or webinars instead of blog posting. Maybe you are ghost writing for them. But I would say that I could go in and with less than 10 slides of statistics show an executive why they should be engaged in inbound marketing. And if folks are engaged in some levels of spend around social media, or paid, or SEO but they are not pulling it all together and closing the loop, that’s a significant piece as well, too. So why are you not tracking this? Why are you not pulling this together? Why are you not getting the maximum amount of ROI based upon what you are spending? So getting that executive engagement is important, and buy-in, and a large piece of it, but there’s a ton of information out there. And we went through five or six slides today about social engagement. And people of all ages are on Facebook and starting to get it. So I think that those are opportune conversations to have about inbound marketing. Mack: The next question comes to if someone is going to outsource their social media management, Ethan, they want to know, what’s an investment for something like that? Ethan: Again, I mean that can kind of be all over the place. Many brands and organizations are outsourcing elements of this because it such a fast moving industry. Things are moving at a very rapid pace. Even personalities are outsourcing some of their Facebooking and tweeting. You want to be transparent, but you also may need some extra sets of hands. Those costs vary depending upon if you want to go fast, faster, or fastest along the way. We’re seeing people at various ranges. So when we look at building an inbound marketing budget for folks, we kind of look at all of the costs associated, whether that be agency costs, whether that be third-party advertising costs, whether that be the cost of tools such as HubSpot. You want to put all of that together and think about it overall as an inbound marketing program within your organization. There may be elements of it that you’re great at but you need help in other areas. So those budgets can vary and can be anywhere from a few thousand dollars and up. So it really kind of depends upon what you are looking for in terms of that. If you need more full service, again, it’s much more time. Mack: So, Ethan, this person has no inbound marketing strategy. They said they voted in the poll that they have no clue what they are doing. Where should they start? Ethan: I would start reading. We’ve been doing some great inbound marketing assessments with folks. That would be another place that I would start to really kind of grade yourself against what other people are doing. See where you really stand. There’s probably some things that you don’t think about or things that you don’t know about. You kind of start to take an inventory of those and you’d be surprised what you have. There’s typically some activities going on, even if people think they are doing nothing, and then start to work through that process. And really start to think about what it is that they want to achieve and what they need to bring a return on that investment. So how many customers do you need to close off the website? What are you goals around traffic? If it’s a new business with zero traffic, that’s definitely a much more difficult place than if you are a 15 year old B2B business and you’ve got 8-10,000 people a month on your website. We work with folks with varying sizes at various stages of the life cycle. But, again, I would think about what it is that you want to achieve. What’s the why for you? Why do you want to achieve it? Why is it going to be good for your business? That’s where I would start. Mack: Great. With that, Ethan, want to say thanks again. Awesome content. Definitely a topic that people are looking for a lot of guidance and help with. Ethan: Thank you, Mack. Thank you everybody for coming out today and spending this hour with us. I hope you join us next month for our e-commerce site search webinar. And please feel free to forward over any questions: info@groovecommerce.com. Follow us on Twitter at @GrooveCommerce or like us on Facebook. Mack: All right, Ethan. Thanks again, as always, for your time. Thank you everybody. We look forward to seeing you next month. And, in the meantime, come play an interact with us online. Have a great day everybody.